While this is by no means a perfect test for comparing web browsers, I thought I might share my results from the latest browsers available for Linux and more specifically Ubuntu 10.04. Opera Mini for the iPhone (also iPod touch and iPad) has already replaced Safari’s resting throne on my iPod touch shortly after it became available via the App Store early this morning. I was a little disappointed with Opera Link since it never actually synchronized my Bookmarks and my Speed Dial on Opera Mini isn’t configurable up to 12 (or even more or less than 9 for that matter). 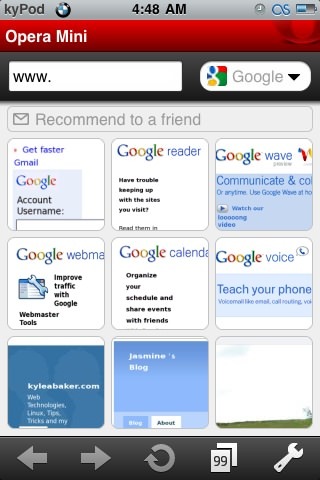 Aside from these relatively small problems, I’ve been very pleased with Opera Mini! Probably the most important advantage for me in Opera Mini is the lightening fast back button (like in the Desktop browser). Pressing back in Safari forces a page reload which consumes a great deal of time if you use your mobile device for browsing a lot! One thing I’m unclear on (and haven’t taken the time yet yo clarify) is the difference between a Bookmarked page and a Saved Page in Opera Mini. Saved Pages seem to load faster, which leads me to believe they may be stored locally for offline viewing, but I’m not completely sure just yet. After installing Opera Mini, I took a few screenshots and thought I might share some of them below just to give some more exposure. Overall I’ve been rather impressed. Nice work and congratulations to the Opera Teams responsible! Fun testing tab limits (99 vertically). 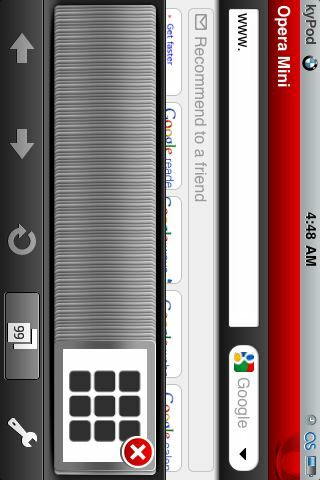 Fun testing tab limits (99 horizontally). Fun testing tab limits (100 tabs...blank). Fun testing tab limits (100 vertically). Fun testing tab limits (100 horizontally). 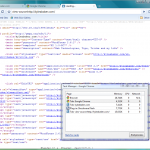 Configuration options with Saved Pages and Find in Page! Today, The Chromium Blog has officially released their ECMAScript 3 conformance test suite in a form that is more friendly to test in your browser. The test contains over 5,000 tests (currently 5,246) and continues to grow! In this example, when running Sputnik on a Windows machine, we saw the following results: Opera 10.50: 78 failures, Safari 4: 159 failures, Chrome 4: 218 failures, Firefox 3.6: 259 failures and Internet Explorer 8: 463 failures. 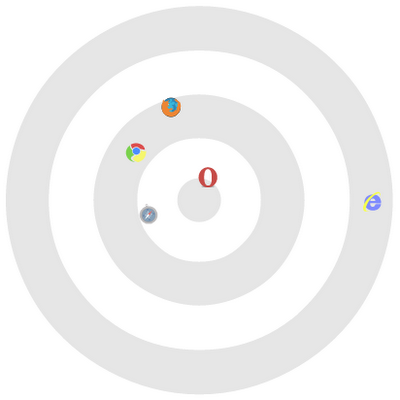 An experimental plot to illustrate how the latest stable browsers compare. Putting that into terms of 100% conformance rates: Opera 10.50: 98.5% successful, Safari 4: 97.0% successful, Chrome 4: 95.9% successful, Firefox 3.6: 95.1% successful and Internet Explorer 8: 91.2% successful. Running the test myself in the latest Opera 10.50 snapshot for Linux (Build 6242) I’m seeing a solid 77, proof that Opera 10.50 is progressing still! 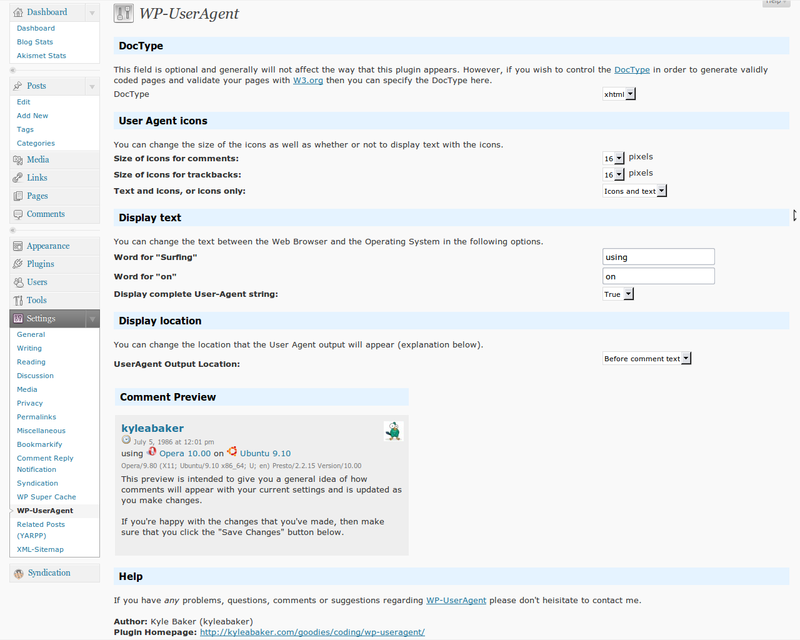 I’ve just pushed a few updates to my WP-UserAgent and WP-TwitterBadge plugins. 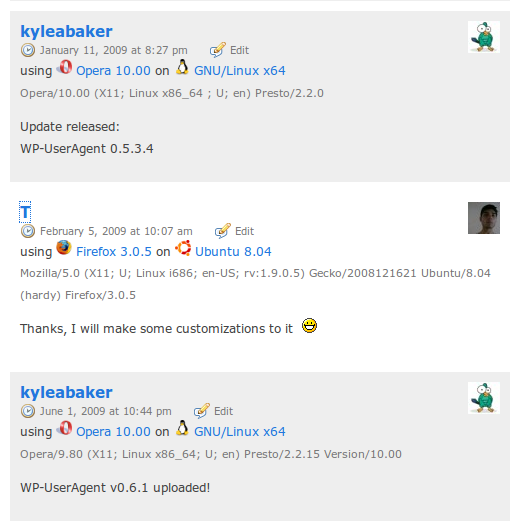 If you’re already using them then you should be able to update via your WordPress Admin area shortly. If you’re not using them yet, feel free to browse around and check into them! It’s been a while since I’ve written my wishlist for Opera. Now that the top five features I’ve requested have been implemented in Opera 10 (to be released), I’ve got to start putting together some items for the next major update! In my previous top five wishlist, I was hoping for features like Developer Tools, Auto-Update, more Widget Capabilities, In-line Spell Check and, last but not least, an Improved Interface. I’ve updated my previous wishlist with links to reference when and how these changes took place, so if you want to look further into that just checkout the first wishlist (linked above). For my new wishlist, I think the them follows the general theme of the previous one..or at least 3/5 of them. I hoping to see Opera become more noob friendly. In it’s current state, it’s very usable for anyone, however, they do tend to have a bit too much of an engineering took and a little skittish on the designer and user interface front. Menu Systems. 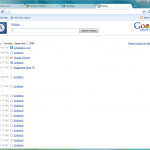 The menus for toolbars and even some main menu bar sub-menus are designed too complex and confusing. If you want one of your less tech. savvy friends to use Opera, don’t show them (most) of the menus! An example of simplifying the menu system would be to simply move the “Customize -> Remove From Toolbar” to the main menu or root level and rename it to “Delete” so that deleting buttons and other toolbar elements is written in clear English. This menu item was moved to a sub-menu to reduce accidental use, however, it is now placed far out of reach and over complicates such a simple task. The naming or wording of this menu item is also overly complex. Firefox uses a simple “Delete” menu item for the same task and it makes the whole thing seem so much simpler. This isn’t the only menu item or menu that is in desperate need of simplifying. I’d like to see each and every menu analysed and modified to make wording as simple as possible and follow general layout structures that all other competitors are using. Completed Opera Link. Depending on how heavily you use Opera, you may know by now that they have a feature that allows you to synchronize some of your settings between different computers by signing into your (free) My Opera account. 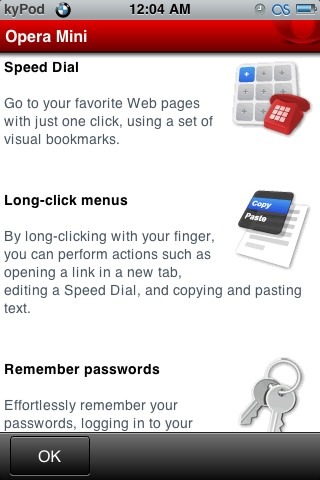 This way you can have the same settings for Opera on two or more different computers such as the same Bookmarks or Speed Dial entries. I would like to see Opera finally complete this feature to support all of the other settings that you hate to update all of the time, such as Blocked Content, Mail Accounts or News Feeds, Widgets, IRC, etc. 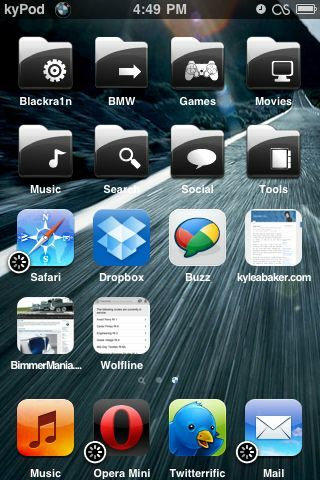 Currently, the only synchronized settings are Bookmarks, Speed Dial, Personal Bar, Notes, Typed History and Searches. [done] <video> and <audio>. 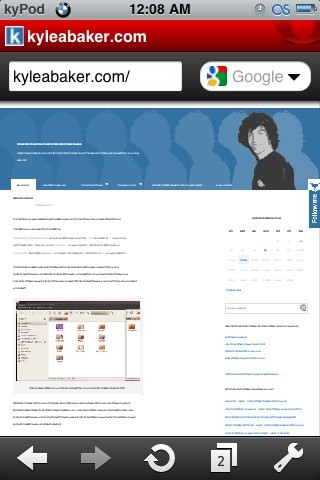 Opera already has some support for HTML5, however, the very cool parts are still lacking. Firefox 3.5 just released yesterday with support for the new <video> tag that will hopefully make the use of flash obsolete. 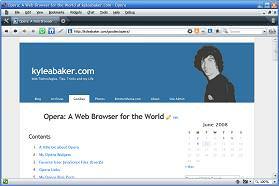 An experimental build of Opera 10 with <video> support was released from Opera Labs a while back, however, they appear to have been slacking in this particular developmental area and Opera 10 is (as far as I know) planned to be released with the lack of support for the <video> and <audio> tags. This is a terrible move in my opinion. However, Firefox 3.0 was not released with these capabilities and only extended to support them later in Firefox 3.5, so it just might work out if they are added later. [done] CSS3 Border-Radius Support. 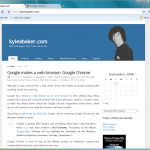 You can notice the lack of support for this CSS gem easily from kyleabaker.com. 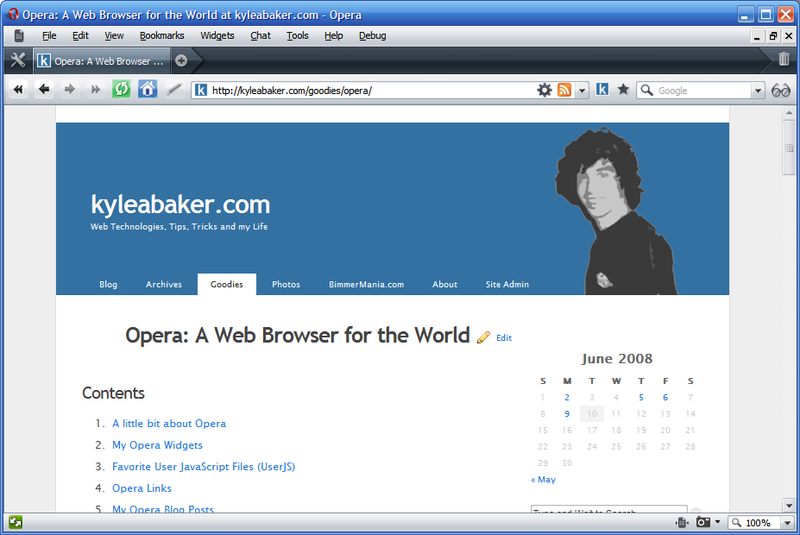 If you compare this page from Opera and Firefox 3+ you will notice that Opera doesn’t render the rounded top corners of the tabs in the header like Firefox does. 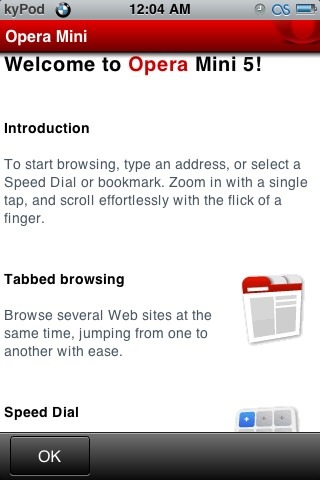 This is a simple CSS3 feature, but it’s also one of the most noticeably lacking CSS3 features in Opera to date. It’s CSS3 candy like this that many developers are anxious to start using and it’s a shame that Opera hasn’t even offered a browser specific border-radius attribute as Webkit and Firefox have done. Bug Squashing Session. The last, but probably most important wishlist item is that Opera takes a break from implementing new features and puts some extreme focus into squashing every last bug in the database. While I know that this isn’t feasible, I do believe that a great deal of priority could be placed on this and then some of the lower priority bugs could finally get some attention. It seems that Opera is continuously releasing new features one after another. While this is great in one respect, it is also very troublesome in another. We all want to see breaking edge technology and sweet new features, right? But, at what cost are we getting these sweet new features? 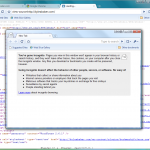 When Opera’s built-in source viewer was released, I remember finding it to be one of the most useful features in the browser for web development. 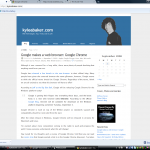 I could easily make changes to a page and view them immediately without any need for uploading and refreshing the page! Now, one of the most limiting features of this source viewer that I’ve found is the lack of line numbers. Something this simple was filled as a bug some 2 years ago (plus or minus) and has yet to be fixed. This is obviously a low priority bug, but a bug squashing session that eliminated the nastiest bugs, allowing time to working on these easier bugs would be great! If you have any ideas for an Opera wishlist, post them in the comments or post a link to your blog article about them! Are you an Opera user and a Linux user at the same time? If so, then you could genuinely help Opera by sending in bug reports and specifically crash reports. I’ve put a could of tools together for you in the form of scripts. If the idea of scripts scares you, then don’t worry. I’ve explained how to use them in the INSTALL.txt file that is in the zip archives for each tool. They are really easy to use and can make your life much easier! If you find that these scripts could be improved and/or extended, feel free to make changes yourself and/or pass them my way so we can all benefit from them! 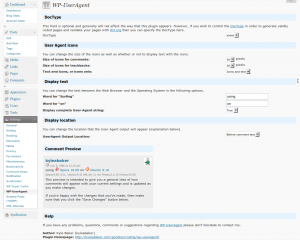 Opera: Kill Freeze – The first tool is a script that will stop Opera when it’s frozen and, if you are using Opera 10+, prompt you with a crash log report so you can explain how it happened. 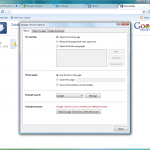 Opera: Crash Report Details – This tool will generate a text file on your desktop with some technical specifics that you should copy and paste along with your bug report. This information can greatly help with finding a bug and reproducing it so that it can be eliminated. Do you have or know of similar tools? Let me know about them and post them in the comments! Details regarding Google Chrome, which if you haven’t heard yet is Google’s new web browser, were recently leaked through a comic that Google released to a selected crowd of people and then the the world when it was leaked online. The comic images show many different features of the Google Chrome browser and help to explain what’s different about Google’s browser compared to other browsers that are already available. It’s worth a read and you can read it here. After refreshing my browser for nearly an hour, Google’s Chrome web site finally became live and I jumped at the chance to download this brand new product and give it a review. Well the review will come shortly, however, I will go a head and reveal some screenshots of the browser and a first look response: shockingly impressive, simple and very stable! 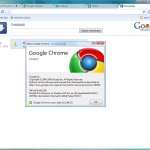 If you want to download Google Chrome and try it for yourself then just navigate over to http://www.google.com/chrome and download and install away. Google Chrome is currently only available for the Windows platform, but Macintosh and Linux should be available soon! Today Jon von Tetzchner, Opera CEO, has officially release Opera 9.5 RC1 to the world. It has been two years since Opera 9 was first released, so you can image the progress and improvements that have been made since then! The version numbering may be a bit confusing, but we all might as well consider Opera 9 and Opera 9.5 to be two completely different versions..like Opera 8 vs. Opera 9. Opera 9.5 has introduced a number of new features and stability improvements since Opera 9 and has even improved compatibility between websites that used to simply not work in Opera. New features that you will find and fall in love with in Opera 9.5 include Speed Dial, Opera Link, Quick Find, Dragonfly, EV (Extended Validation) and new sportier and improved skin! 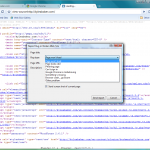 Get to your favorite Web sites with just one click! 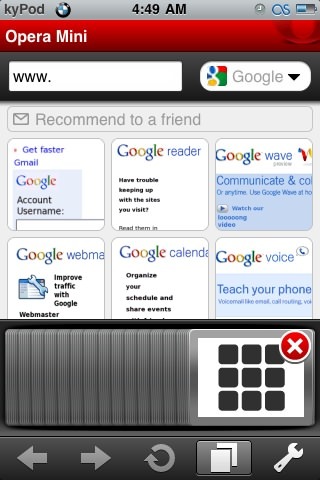 Speed Dial is a set of visual bookmarks you see when you open a new tab. 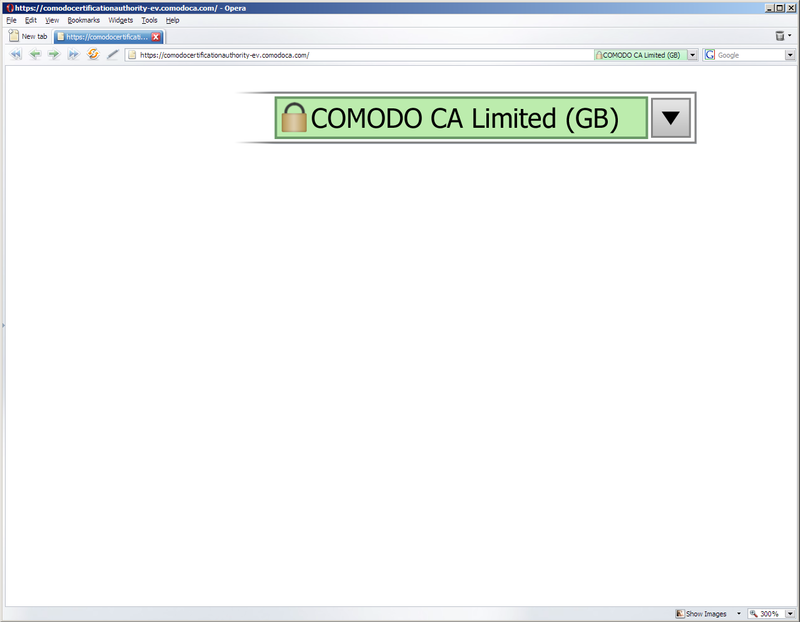 To add a new page, simply click on an empty Speed Dial. Access your favorite Web sites everywhere! 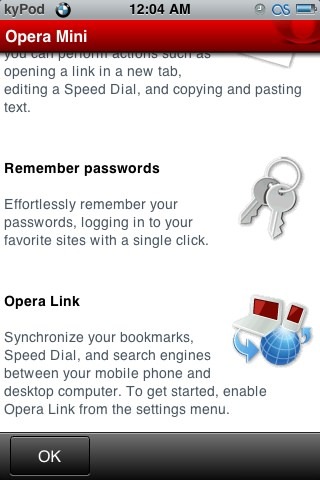 Opera Link syncs your bookmarks and Speed Dial between your computers and mobile phone. 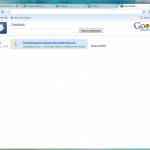 Log in with your Opera username, and your data will always be accessible. Have you ever forgot the page where you found that great article or that perfect gift? 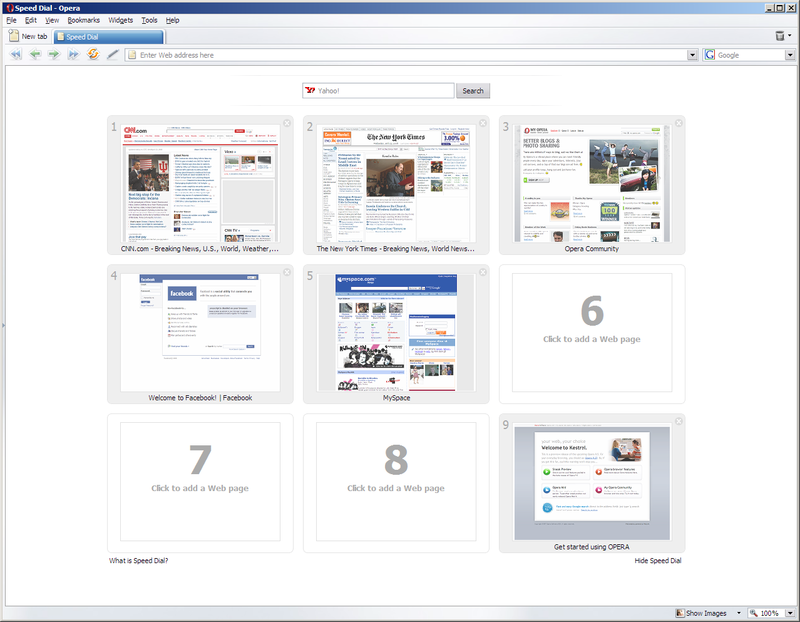 Opera remembers the actual content of the Web pages you visit. 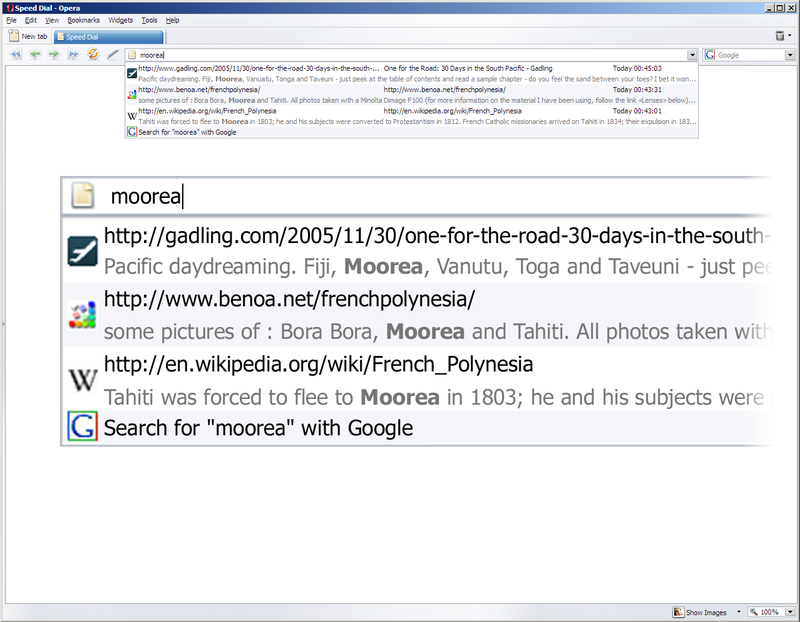 In the address bar, just type one word you remember, and Opera finds the page for you immediately. 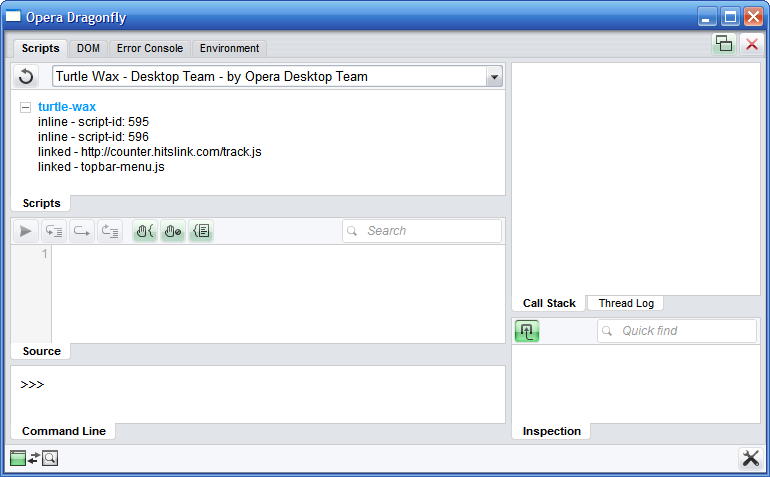 Opera 9.5 features a new version of Opera Dragonfly, the upcoming Opera developer tools. 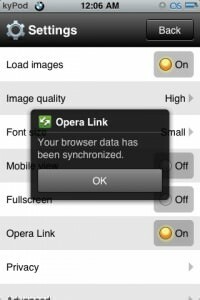 Opera Dragonfly makes developing using Opera easier than ever, both on your computer and mobile phone. 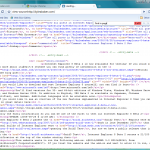 Not all Web pages are what they say they are. In Opera 9.5, Fraud Protection is enabled by default, detecting and warning you about fraudulent Web sites automatically. Support for Extended Validation certificates (EV) provides added assurance and trust for secure Web sites. 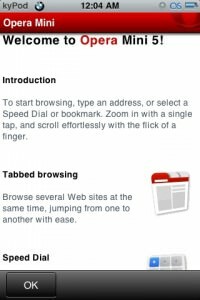 To top things off with, Opera has introduced a new default skin for the browser that is designed to make your life easier and make the browser look more mainstream. I’ve covered some of the changes made to the skin and layout in another post, but the main things that changed were the placement of the New Tab button, the Home button has returned by default and the coloration of the icons and tool bars have changed. Now it’s time to, as Opera CEO Jon von Tetzchner said, continue to support Opera by turning the whisper into a shout! 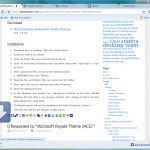 Go check out Opera 9.5 RC1 now!